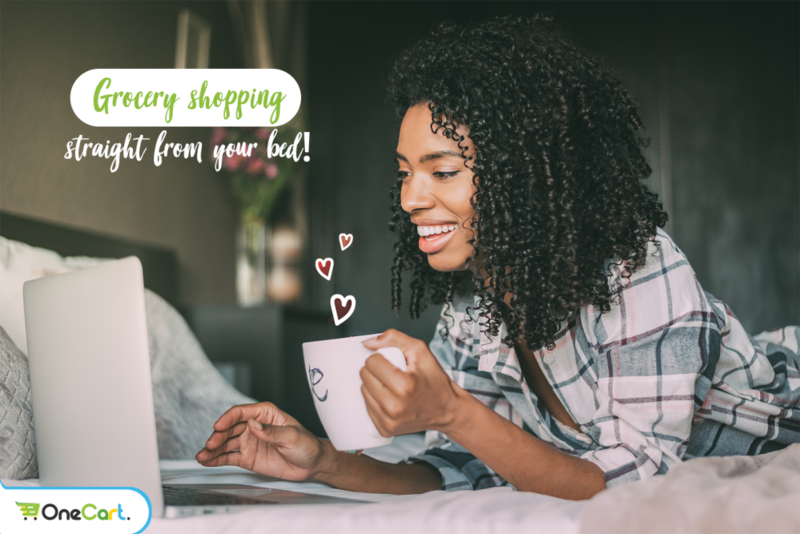 OneCart is basically that – a one-stop shopping experience, selecting goods from different stores, your supplies collected in one cart and promptly delivered to your door. Sounds too good to be true? Well no, it’s OneCart- convenient, flexible, efficient and above all, smart. The website is straightforward- choose your location and start shopping from different retailers such as Pick n Pay, Woolworths, FitChef, Dis-Chem, Pets by OneCart and Booze by OneCart. The service offers a personal shopper who shops for the best products- and if a product is out of stock they will call you to make sure you’re happy with a replacement. SMS, email and social media pages on Facebook and Instagram keep you on track and delivery can be within 2 hours or a selected time that suits you. You can also collect from their Benmore Gardens office and save on the delivery cost if you are nearby! Prices are kept the same as if you were to shop in the store and the delivery fee is R55 to bring it to your house. No fuss, no traffic, no parking fees. Smart. I have an R 1500 voucher including free delivery, to give away to one lucky reader, all you need to do comment below and let me know why you need this voucher and the OneCart services in your life. Winner MUST reside within the greater Johannesburg area. Competition closes 12th April and the winner will be contacted via email. No money for luxuries as I have single handed put my son through law school and now its pay back time.. This prize is awesome. To order all your favourites on line , the luxuries that would never be on the shopping list. I need this treat because exposure refuses to be taken as a currency AND it saves me the petrol to drive anywhere! Working 15hrs a day doesn’t leave much time for down time and makes grocery shopping feel like a grudge purchase. This would allow me some me time. I would love to win because been unemployed really has its downfall. This voucher would allow us to indulge a little. And I think this is an awesome service. Currently I’m recovering from an operation which means that I can’t drive. So the fact that delivery is a mere R55 and prices are the same in store, hubby won’t need to do the groceries after work. Winner winner chicken dinner! Leggo! I would love this prize /voucher because I really enjoy online shopping, and with the little time I have during the week and weekends, this would come im handy for me,because of the free delivery and the fact that they deliver. A total time saver and convenience! This voucher can change. My whole life as someone who is not working so atleast this month I could be the one put something on the table in the family…. It would be great to win this for me and my family. My son is 11 months old and if I’m not at work I dedicate all my time to him, it would really be great to have necessities delivered to our door step. I need this voucher as it will give me a good financial break for a month as Ill get to buy my monthly groceries on one cart using the voucher and the money I would’ve used can be used for something else that I need. One Less day at the shops dealing with Tantrums and paying for stiff that wasn’t on the Grocery List but landed in the trolley because…Long Naughty Hands. Any Mom’s Dream really…. Wow would be so awesome just to get a break and buy the food that you what and to spoil your family with something nice. I am a Mrs SA Semi-Finalist and have 2 BIG event mid April! So prep for the next 2 weeks is going to be manic so if I don’t have to worry about groceries, I would be thrilled!! l love to win to spoil my family as we are really struggling to make it through the month on 1 income and as the cost of living is rising each and every day. We barely have enough to pay the bills so winning this awesome prize will.be dream come true. I need this voucher for my 92 year old gran who insists on going to malls on Pensioner pay days. Sometimes I have to take half of the day off, from work, so I can accompany her. I need to show granny the convenience of grocery shopping whilst you’re in bed, sipping a hot cup of coffee, or whilst on the couch and catching up on your favourite soapie. Elderly people are stubborn so I need this to win her over. @NoctunalWenchy and I would love to support this venture and with our busy lives Onecart sounds like a great option. Anyone would be happy to win this awesome prize and every little bit helps in this tough economy. Do we deserve it more? Not necessarily at all because there are so many people with less than us and really struggling but it would be really cool. Another amazing prize. Would be a great help when budgets are tight. I also have never tried online shopping as yet. I need this in my life cos I don’t have the time or energy to go grocery shopping with a newborn and a toddler. Also I need ideas on quick and easy meals cos life is hectic at the moment. l love to win to spoil my son who is a student in jhb and needs a little spoiling to help him to take care of his monthly expenses. This would ease the burden for him and would be one less expense for him to budget for. I will be able to treat my family. Ease, convenience and a great service, i think we all need this service! The voucher would be such a warm welcome amidst the uncertain months of 2019. It would definitely fill a gap where it is most needed. I would love this prize as I’ve been having problems with my ankles and feet, thereby not been able to stand much less go shopping! I went blind two years ago and while I have recovered some of my sight I am no longer able to drive. I am now receiving a State pension as my sole income. Living in a frail care facility with no transport delivery is the only option. I would really appreciate this voucher. This would be so awesome, as with time and financial constraints, this will help with my little boy’s school lunches and snacks, and other requirements, eg. Wet wipes, that he needs to take to school on a regular basis. Firstly, Thankyou for giving us the opportunity to win the voucher, as it would be such help for some of us. Always enjoy reading ur articles on Facebook. I look forward to enjoying a delicious and healthy treat. I would love to win this as my contract has expired so from 1 April I’m officially unemployed again and since we don’t have a car this will really help us so much. Well I’d love to top up my cupboard. Last did grocery shopping in February. Life is too busy to incorporate shopping when you need it which means we often miss out on what we need or want due to lack of time. This service would be great to assist in those busy days where you’re desperate for your shopping supplies but don’t have time to go out and get it yourself. I am a student who works full time and studies part time. I live alone and being able to have groceries delivered to me would be amazing, since I often don’t have time as I have such a busy schedule!! OneCart services needed because as a working mom, wife and part time student, one never really has time to go to malls and get some shopping done. i love the fact that i can get my favorite supplies collected in one cart and delivered to my door step… the best part is that i can do everything online and not be restricted to one store.. with the current economy, the voucher could come in handy this coming Easter as we will hosting at our place this year. Being a newbie to pension life, I could do with a “little help from my friends” at OneCart. Life is really expensive and although cut backs have been done, there is just not enough budget for the month. A spoil of this size would go a far way to taking the edge off. I would love to win this voucher simply because more food undoubtedly creates the welcoming environment associated with a better mood.